Motorists in Cape Town were warned last week to avoid segments of the city’s highway where road blockades had been constructed and trash and tires set alight. Local newspapers reported only that the blockades were part of protests staged in the shanty towns lying along the dusty, windswept flats of the city’s outskirts. 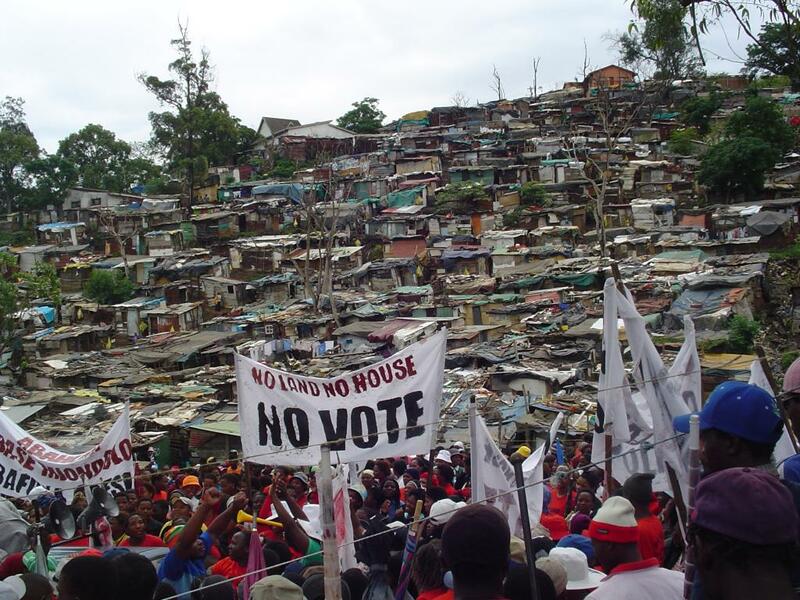 The blockades were in fact part of a month-long “strike” of informal settlement-dwellers organized by Abahlali baseMjondolo of the Western Cape. Centered in Khayelitsha, a black township area of about 1.3 million, the movement mobilizes those who have erected basic shelters without the state’s permission and who are sometimes subject to violent removals by local police. The informal strike campaign was an effort to protest this repression and demand accelerated efforts to provide housing to the nearly one in four South Africans who live in shacks. Sixteen years into democracy, South Africa remains a place of dire poverty and alarming inequality. In Cape Town, apartheid’s continued legacy of social segregation means that such conditions in the city’s townships may go almost unnoticed by the eyes of the media and middle class. Referred to as the “dumping ground of apartheid,” the settlements along the city’s highway continue to house black and colored communities in poverty conditions with few opportunities for employment. Aside from the inconveniences caused to motorists, Abahlali’s strike campaign thus came to a close with few signs of it having registered in Cape Town’s commercial center and wealthy suburbs. The muted public reaction to the movement’s appeals reveals much about the politics of protest and visibility in contemporary South Africa, where new movements of the poor are still struggling for recognition as they contest a government credited with ending apartheid. Since 2004, a wave of mass mobilization has been taking place in South Africa’s townships and informal settlements. Referred to collectively as “service delivery protests,” these demonstrations bode poorly for the country’s democratic institutions, which hold less and less legitimacy among communities for whom democracy has brought little change. The country’s transition from apartheid brought an end to white rule but stopped short of changing the society’s skewed distribution of wealth and resources. In the post-apartheid era, a highly progressive Constitution and the most powerful union movement on the continent have failed to end enormous racial and class inequities. The response to this disheartening reality is still being contested amongst organizations hoping to use litigation, voter mobilization, and political lobbying to advance social justice, as well as by those insisting on the inadequacy of the country’s democratic institutions to reverse centuries of exploitation. Mass protest has a well-established history in South Africa, and its legacy is by no means dead. A public sector service strike, spearheaded by the Congress of South African Trade Unions (COSATU), saw 1.3 million workers stay out of schools, hospitals, and offices for three weeks this August over a wage dispute. This strike was the most recent to pit COSATU against the governing African National Congress party (ANC). The two organizations, together with the South African Communist Party, make up the country’s tri-partite alliance that was formed in 1990 and continues to ensure broad support for the ANC. Strike campaigns against the ANC have become a regular, if often disdained, feature of the nation’s political landscape, but they have brought only incremental improvements. In a country where unemployment hovers at around 40%, the traditional working class agenda is also increasingly out of touch with the interests of informal workers and the unemployed. Meanwhile, organization outside of state structures often lacks resources, public support, and the symbolic power of organizations that still possess “liberation social capital” for their role in the anti-apartheid struggle. Access to housing was one of the chief promises of the Redistribution and Development Programme, the economic platform on which the ANC ran in the 1994 elections. Demand for government housing has been growing faster than it is being supplied however, and according to Abahlali, the Western Cape province alone has a housing backlog of 500,000 that is increasing by 20,000 each year. The movement asserts that at the current rate at which the provincial Department of Human Settlements is constructing shelters, the housing crisis will not be resolved for another 50 years. In the meantime, residents are without access to clean water and electricity and are vulnerable to fires that are started from makeshift gas stoves and often rip across shacks in the settlements’ crowded conditions. The slow pace of change in the new South Africa can be attributed partially to the entrenched legacies of apartheid, which forced blacks into crowded urban townships and rural “homelands” while exploiting their labor for agricultural and industrial development. Inequality has actually increased since 1994, stemming from the democratic governments’ embrace of a broadly neo-liberal economic program. While 2.3 housing units have been built, at least 2 million more have lost their homes, largely because of rising unemployment catalyzed by rapid trade liberalization. In the aftermath of its liberation by Marxist forces, South Africa has become a capitalist state pursuing a trajectory of export-led growth, and its promises to improve the conditions of the most downtrodden members of society remain mostly unfulfilled. While many international observers have struggled to understand what appears to be an example of “the revolution betrayed,” the roots of social stagnation in South Africa lie in the nature of the country’s transition to democracy. As with many revisionist accounts of social struggle, the key role afforded to the ANC and its allies has obscured the involvement of a plurality of actors and ideological positions. Some of the most divisive issues concerned the connections between racist and capitalist oppression, as well as the best means of eliminating both. The 1993 Kempton Park settlement paved the way for democratic elections and prevented further escalation of violence in a country already wracked by it. However, socialist groupings, such as the Azanian Peoples’ Organization, rejected the deal as leaving the distribution of economic power essentially unchanged. The continuation of armed struggle initially had considerable support both within the ANC and amongst other organizations. Today, these issues remain as tough questions about the ability of nonviolent campaigns to bring about changes to the structural foundations of the economy. Service delivery protests against local governments have reached such a proportion that they have been referred to as a “rebellion of the poor.” In the absence of effective institutional avenues, communities protest poverty conditions using mass meetings, processions, road blockades, and sometimes looting or destruction of buildings. Abahlali base Mjondolo, which was founded in 2005 in the port city of Durban, identifies as “the largest organisation of the militant poor in post-apartheid South Africa.” The newer western Cape branch is affiliated to the national group, and its month-long informal strike campaign saw the participation of at least fifteen settlements in Cape Town as residents held rallies and mass meetings and temporarily closed roads leading into their settlements. This touched off a bitter public exchange between Abahlali, the Treatment Action Campaign, and the South African Communist Party that exhibited the profound frustration with the lack of change in the new South Africa. It also highlighted many of the issues of power and representation that have often created deep divisions between those espousing different ideas of how to catalyze improvements. At the heart of the debate is the question of what constitutes “legitimate” organization of the poor, both in form and tactics. While the Treatment Action Campaign alleged that the campaign constituted “violence,” Abahlali responded that they have never called for harm to human beings. “We have a long experience of the state calling protests in which no person is harmed violent. We did not expect a social movement to make the same mistake,” Abahlali explained. This statement refers to the harsh repression that protesters have often faced from police forces in South Africa. Just last month, four people in Cape Town’s Hout Bay area were shot and blinded by rubber bullets while police were trying to enforce a decision to evict them from an informal settlement. But the cost of such protests on these communities is not something Abahlali addresses. Local police reported that ten vehicles had been stoned and set alight during demonstrations occurring the night of October 19, but the movement said this incident was perpetrated by criminals unaffiliated to them. TAC also alleges that the campaign had endangered local residents who were dependent on public transportation and prevented ambulance and fire services from reaching the area. Another aspect of Treatment Action Campaign’s statement questioned more explicitly whether Abahlali’s campaign was effective. The strike was a measure Abahlali leveraged against its demands to the national and provincial departments of human settlement, which were delivered by memorandums in September. Rebecca Burns is an M.A. Candidate at the Kroc Institute for International Peace Studies, University of Notre Dame. She is currently living and researching in Cape Town, South Africa. Its important to note that during the AbM strike not a single person was physically hurt in any way even by the ‘criminals’ who apparently mis-used the call to protest. Therefore the strike can’t really be called violent. Whereas COSATU strikes always include a lot of violence including beating up people who don’t support them. Unfortunately, the strike didn’t have as big an impact as it should have. Hopefully future protests will be more widespread and effective. This is a very fair and thoughtful piece on a complicated and highly contested situation. There is no doubt that AbM of the Western Cape has been demonised by a number of ANC linked groups recently and it seems, to me, that it would be naive to think that this is not linked to the coming election and the fact that AbM of the Western Cape has been mobilising against all political parties – including the ANC – and encouraging people to build their own power against all the political parties. It is also essential to stress that it was very unfair, and really quite reckless, for TAC to call a campaign of protests and road blockades ‘violence’. Disruption is a tactic that, like any other, can be debated but to call it ‘violence’ when it is clearly not is not debate – it is an attempt at the demonization of another movement. TAC’s misuse of the term ‘violence’ was potentially itself quite dangerous given how it risks playing into the hands of the state – a state which has engaged in serious and often violent repression of AbM and other popular movements over the last few years. However it is clear that some of the claims made by AbM of the Western Cape for their campaign were rather over the top and over ambitious. The campaign has certainly demonstrated the degree of popular anger and that is important. But it certainly didn’t bring the city as a whole, let alone the country, to a standstill. But AbM of the Western Cape is hardly the first movement to aim beyond its reach. Hopefully this has all been a learning curve for both TAC and AbM of the Western Cape. I was just searching for this info for a while. After 6 hours of continuous Googleing, at last I got it in your site. I wonder what is the lack of Google strategy that don’t rank this kind of informative sites in top of the list. Generally the top websites are full of garbage.